We’re wicked stoked to once again team up with our favorite outdoor adventure gear company, Matador, for the official release of their new FlatPak™ Series. It’s a whole new kind of travel bottle. 5x lighter and 3.5 more compact than traditional soap bottles. We didn’t realize how cool and practical these were until we used them. With Dry-Through technology and TSA approval, the FlatPak™ Toiletry Bottle, and the Soap Bar Case are both available now from Matador! Get them both stat, to kick off your summer travels in style. The Scrimshaw Brothers recently caught up together, this time out in sunny Southern California. 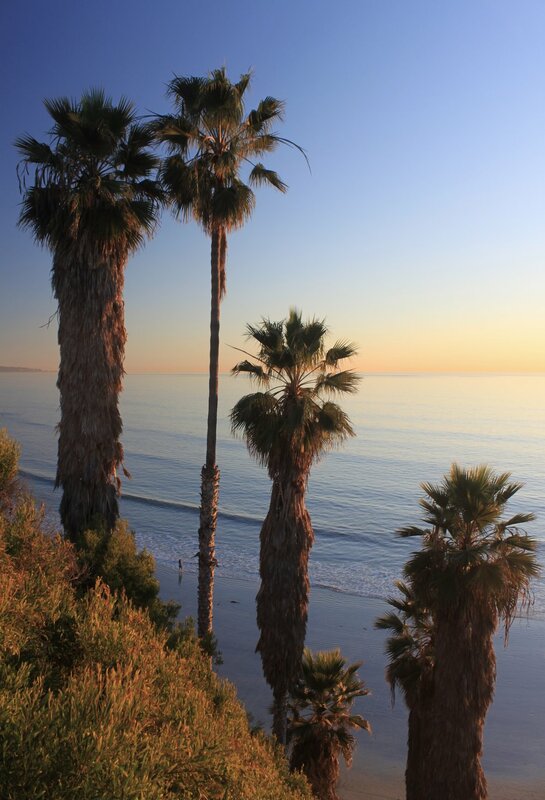 Reporting live from the West Coast HQ, we spent the day photographing and chasing the sun around one of America's most scenic coastal towns, Encinitas. And we wouldn't have been running around with anything but our trustworthy and loved Matador goods - our favorite packable adventure gear! Matador's produced an awesome Indigo line for most of their packable bags, including the Matador Freerain24 Backpack (pictured above and below). We've always got the Matador Camera Base Layer protecting our cameras when we're on the go (seen above). But at the moment, Matador's actually making huge improvements to the Camera Base Layer, and we can't wait to see what they've got in store for their relaunch in early March. The quickest way to dry off from a dip is with the new LARGE Matador NanoDry Shower Towel, perfect for the beach, rivers, lakes, or even the gym (pictured above). The NanoDry Towel is incredibly light and dries super fast, plus it comes with a convenient silicone carry case & carabiner. Another hugely adventure packed day with non-other than our reliable and dependable Matador gear. Enjoy some pictures from our day by the beach. Whether you're off for weeks on the global adventure of a lifetime, or just a rocking day being a tourist in your hometown, Matador gear has got you covered every step of the way! Now get out in that sun, rain, snow or whatever, and get exploring! Let’s get off the grid. Let's explore our personal unknowns and expand what we perceive as normal. Every so often it's important to engage in self-reflection to make sure that your batteries don’t need charging and to see if the path you are on, is indeed the path you chose for yourself. If that vision gets clouded…welcome to the club. Fortunately, I surround myself with like-minded individuals who push each other to get out there and explore. At Scrimshaw, we engage with brands who embody that mentality to the fullest. So when we decided to go to Nicaragua for 2 weeks, the first thing I packed (other than my camera) was my Matador gear – convenient, compact and essential. Now part of going off the grid and recharging is doing just that – going off the grid. Leave the phone behind and make memories. Absorb the moment and be selfish by holding onto those fleeting seconds and sharing them just with yourself and your company. But to give you jusssssst a taste…we surfed empty beach breaks at Playa Colorado, drank Toñas overlooking the Pacific in San Juan Del Sur, went fishing with new friends, hiked Volcan Maderas (a volcano in Ometepe), swung from rope swings in the natural waters of Ojo de Agua, and made friends with the locals who showed us the correct way to move our hips (apparently Americans dance with their shoulders). Throughout all of these adventures, Matador was there to bring comfort and convenience through its compact products, waterproof material and outdoor style. The NanoDry Trek Towel provided a perfect way to absorb both sweat and rain during our hike into the rainforest on Volcan Maderas. It doubled over as an ideal towel after cooling down with a swim in the natural waters. The NanoDry Trek Towel was held by our Matador Freerain24 Backpack which is probably my most travelled piece of outdoor gear. 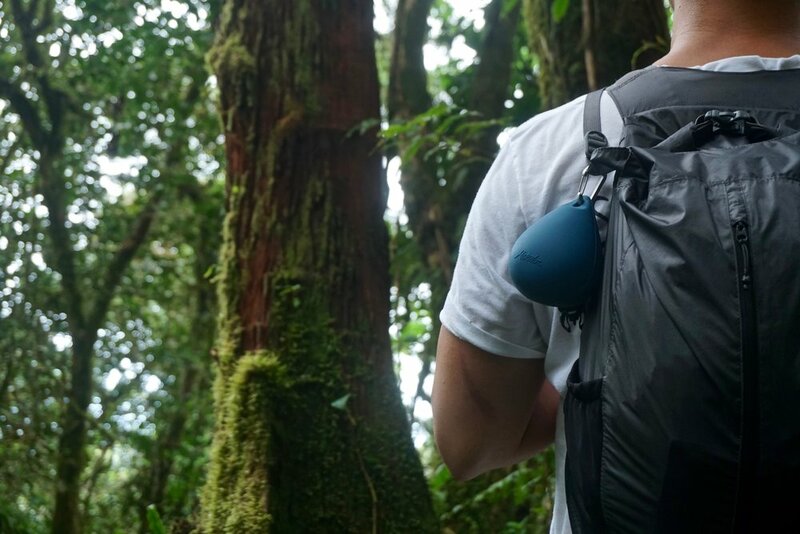 This sleek backpack kept all phones and cameras dry as well as provided a light way to carry the essentials (beers included) all throughout Nicaragua. But, my personal favorite and absolute essential item is the Matador Droplet XL Dry Bag. This has saved cameras, phones, wallets, pictures, directions…you name it. Not only does it clip onto backpacks and belts, it also provides the necessary coverage for all valuables. It’s easy to get travel fever, but its hard to bite the bullet to press that “buy” button on that ticket you have always put off. But, why put it off. Grab your friends, loved ones, or travel alone and get your essential gear that you can't live without. It’s time to recharge and put yourself out there. Get off the grid. Go. Summer 2017 has finally arrived, with the glorious three-day celebration that is: Memorial Day Weekend (MDW). Despite some cloudy weather, we ventured up to Groton Long Point / Mystic for a few nights, for the first of many trips this summer. And now, heading outta town for a long (or short) weekend away, just got much much easier, with the extremely lightweight packable travel gear from Matador! Originally born in the Bay Area, Matador, the packable travel & adventure gear company quickly grew, and relocated to one of the country’s sunniest towns, Boulder! Creating products they ( - AND WE - ) LOVE, focused on form and function, Matador takes on the great outdoors to test their goods. You won’t find any Dexter’s Lab shenanigans here, but what you will find is Matador’s product development team taking advantage of the Colorado elements to screen their gear before distribution. And now, we've been testing this gear on our own from the Central Pacific to the New England shores, and we 1000% approve. One of our favorite's from Matador is their waterproof packable backpack, the Matador Freerain24 Backpack! This 24 litre waterproof pack, also collapses to roughly the size of a beer can - fits like a glove in your hand. Made from the finest materials avaialble, it holds up phenomenally getting unpacked and repacked into it's attached case, and is perfect to either use as your only bag for a weekend away OR to bring as a day pack for your adventures around town. But what would be time away from home, without your camera! If you're leaving the bulk of your camera gear back at the apartment, and are just on the fly with your SLR, then the Matador Camera Base Layer is exactly what you need! Think a down puff for your little guy, which also has an integrated rain fly to keep your camera safe from bumps, scratches, and unexpected weather. It's wicked easy to get the layer on-and-off the camera, and when you're shooting, just clip the case onto your back or even your belt. What also seriously came in hand once the sun showed up was Matador's Pocket Blanket 2.0. This ground layer is water repellent, puncture resistant and extremely compact - when folded up, its just about the same size as an iPhone! You inside it out from it's case, and the VOILA - you've got a great ground layer for a picnic, a quick lay in the park, or even a wrap on the boat. Two great perks for this piece include: A) four small metal steaks tucked underneath each corner, so you can secure the blanket into the ground; and B) patterned stitching on the underside of the blanket to guide you on ALWAYS packing it up perfectly back into itself. A++! As the sun rises over the Pacific, my freshly brewed hand-pressed coffee energizes my soul, while a light offshore sea breeze fills my lungs. I close my eyes, take in the moment, and exhale, ready for the day. Today I am in Maui. Before the day has set, I will have stood atop the peak of a volcano at 10,023 feet, hiked to a waterfall oasis and surfed in the clearest of waters. What’s wild is that the only thing I will have carried is Matador’s ultra-lightweight, 24 Liter, waterproof backpack that can fold into itself, becoming the size of my hand. Oh and I forgot to mention, in this bag I’m carrying Matador’s Nano Shower Towel, Pocket Blanket, Droplet XL Dry Bag, Camera Base Layer, Droplet Wet Bag, and my DSLR Camera…crazy. It's still early when I make it to the summit of the volcano. The temperature drops 30 degrees in a matter of minutes, while the wind whips, and I gaze out over Haleakalā (known as the house of the sun). My Matador Freerain24 Backpack is light, breathable and insanely durable. I pull out my camera, which is snug and safe within the Matador Base Layer. The Camera Base Layer fits my DSLR with all of my lenses, weighs only 68 grams AND has a built in water and dust protection layer (this is such essential gear for me as my camera is like my baby). I unfurl my Nikon within seconds and connect hand to lens and get lost in the beauty that lay before me. Transitioning from exploring above the clouds, to hiking through a Bamboo forest in search of a waterfall was easy, thanks to my packable gear, my thirst for a swim and the thought of roadside pineapple. Walking among the creaking of the bamboo with the local sounds of wildlife, I couldn’t help but think I was in a different world. I made my way through the palms, following the sounds of the river to a clearing in the shrubbery, which opened up into an empty serene oasis, the Twin Falls. Trudging through the bank of the river, my gear is light and dry. My gaze is steady and full of wonder as I look upon the 3-story waterfall flowing into a natural swimming pool. Laying my Pocket Blanket down and putting my gear safely on top, I remove my Droplet XL Dry Bag, which is totally waterproof, and fill it with my clothes and camera. While I swim and float below a waterfall, letting my inner-child loose, keep reading to see why Matador will always be an essential part of our Scrimshaw gear. What started as a pocket-sized blanket that unfolds to seat four people, became a passion for designing and developing packable adventure gear. Based out of the outdoor mecca, Boulder, Colorado (where the streets meet the mountains), Matador is focused on staying true to their roots by using the local mountains, rivers and plains as their “office”. All of their products are designed entirely by the their team who all have unbridled passion about the outdoors, travel and adventure. This passion translates into well-designed, thoroughly tested, highly capable products that people can depend on. With Matador gear in your pocket, you can go ahead and #PutYourselfOutThere. Time to #AdventureOn. Talk about dedication to honing your craft. Now you get why Scrimshaw trusts Matador with all our exploration needs! Drying off with my Nano Shower Towel, I make it back through the palms and bamboo to feast on much needed pre-surf fruit. My legs are dead tired, my body is sun-kissed and slightly worn. I know the end to this perfect day is sliding along glassy waves. It’s, in my opinion, how every day should end. As I stand on the beach, looking over a cloudless horizon with chest high sets rolling in, I close my eyes, take in the moment, and exhale, ready to close out the day. 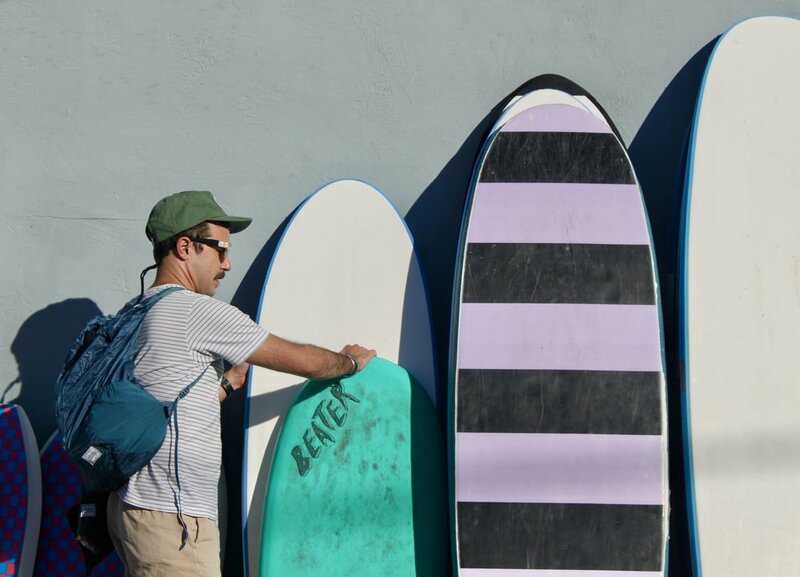 Tossing my cell-phone and wallet inside the Droplet Wet Bag I grab my board and walk straight into the ocean, knowing that today, I put myself out there.